By the time I reached Jaipur – India’s famed Pink City – I was exhausted. A quick calculation of my first day’s progress told me I’d traveled only 170 miles in six hours of riding, making my average speed 28 miles per hour. The roads’ condition caused the slow ride, and while it didn’t make for record-breaking time it did give me a sore behind. I was not used to the saddle and vaguely wondered if I ever would be. At the moment, however, I did not care. All I wanted to do was find the hotel I had pre-selected from my guidebook, but I did not know how I was going to do that. Every direction I looked, looked the same. Every road I rode down led me back to the same place: a bustling precious gems market in the center of the throbbing city. Jewelry hawkers jangled silver and gold necklaces at me as I cruised by them over and over again. I passed the same necklace sellers so many times I felt as if I’d entered a Twilight Zone episode. Eventually, I did find the hotel – a two-storey mud colored building crouching at the edge of town. It looked lonely way out there, and the wall encircling it imparted a penitentiary-like atmosphere to the place. The dower expression of the chowkidar who was posted to guard the grounds did not add any friendliness to the place either, but his presence – that of a guard – was exactly why I had selected that hotel. I knew from experience that Indian men loved to fiddle with the controls of unattended motorcycles. Especially Bullets. They couldn’t keep their hands off them, and I wanted to make sure that didn’t happen on this trip, if possible. On more that one occasion I’d come out of a shop in New Delhi to find a man twisting the throttle and flicking the light switch on and off. Sometimes he would be sitting on Kali. But when caught, he never looked ashamed; often he did not even smile acknowledging. He simple ambled away dreaming of the next motorcycle he could molest. I parked Kali near the chowkidar – an old man trussed up in military greens. He nodded at me, acknowledging he understood his duty to protect Kali. Two bellboys scurried to their feet as I entered the lobby with my helmet tucked under my arm, but stopped short after a couple of feet and stared at my disheveled appearance. I smiled and moved past them to the front desk and asked for a single room. The desk clerk said he did not have one and offered me a double instead. “I can let you have it for a very good price, madam,” he said smoothing his mustache with two fingers while trying to maintain a professional countenance and not show alarm at my appearance. My feet felt like soggy rags in my boots and I could only imagine what I looked like. I wanted to take the boots off, along with the rest of my clothes. I wanted to do it now. “Does it have a desert cooler?” I asked. A desert cooler is like the Neanderthal of air-conditioning. It is a big metal box that sits in the corner of the room or in a window (if there are strong poles to hold it up on the outside) and water is poured into its basin-bottom. The sides are fitted with grass filters and a small pump draws water out of the basin and through tubes that run along to top of the filters. The tubes are perforated with tiny holes that allow the water to trickle out and soak the filters. A fan built into the front of the cooler turns and pulls air across the water, creating the cool air that is then blown into the room. It isn’t pretty but its effective. That sold me, that and the fact that the room cost $6. I was on a budget and had a long way to go before I got back home again. The bellboys wrestled over who would carry my bags to my room, each hoping to be the recipient of the fat tip they were sure I’d proffer. One boy won and he followed me outside. I stooped to untie the saddlebag and satchel then lifted them off Kali’s rack. Together they were heavy and the boy did not look as if he could handle them, but he assured me he could. My Hindi was not great (although I had lived in India for four years and took a four-week intensive language course just prior to setting out on this journey) but I understood his nodding and “thik hahns” to mean, “yes.” In fact, he probably was not speaking Hindi at all but rather Rajasthani since I’d crossed the boarder earlier that day and was now in the state of Rajasthan. India consists of twenty-eight states stitched together with sand and dust and rivers. Hindi is but one of twenty-two major languages recognized by the Indian government. (Hindi and English are the languages of official communication for the national government.) There are also thousands (some say as much as 22,000) dialects spoken across the hills and deserts of India’s 1.25 million square miles – roughly one-third the size of the United States. The bellboy broke into a run-walk toward my room, his body buckling under the weight of my bags. His awkward gait made him look like a chicken trying to run with its legs tied together, but he was still faster than me. By the time I reached the room he had nestled my bags into the corner and was switching on the desert cooler. It roared to life, squeezing the silence out of the room in a way that shut out the world and the day’ events so completely that I felt a cocoon-like comfort come over me, and I was grateful. I needed some time to consider how the first day had gone, and I wasn’t ready to do that yet. I tipped the boy and turned to inspect the bathroom. As long as there was water – hot or cold – I would be happy. I creaked open the door and peeked in. The room’s low-voltage watt bulb eked out enough light that I to see a shower spigot jutting from the wall. Most Indians don’t shower but bathe by dipping a large plastic cup into a bucketful of water. Water is precious in the subcontinent and Indians are acutely aware of its worth. In India, only 92.6 percent of urban homes have indoor plumbing and only 72.3 percent of rural homes have “reasonable access” to piped or hand pumped water. Like most countries that experience a resource scarcity, the poor pay a greater price. Village women and girls may have to walk miles to collect the day’s water ration; one bucketful provides the family with drinking and cooking water for the day. In cities, poor women and girls line up at public pumps to catch their daily allotment of water. In American, we stand under our showers until the water runs cold without giving it a moment’s thought. I’ve never been a person who took long showers, but I would need to wash my clothes daily. I carried a limited amount of clothes for the journey, which meant washing my t-shirt and underwear at the end of each day’s ride. It seemed a minor price to pay for traveling light but a major luxury in a country were water was in short supply. I stripped, went into the bathroom, and looked into the mirror. That is when I caught sight of Kali, or rather me looking like Kali with my bug-splattered face, wind-whipped hair, and a crazy gleam in my eyes. The ride had caused that look. It had been a harrowing day as I was run off the road over and over again by truck and busses. I had known going into this adventure that life on the road would be dangerous, that the road itself was dangerous. But it is one thing to know something intellectually and another to experience it emotionally and physically. I knew a lot about India’s roads, their condition, and the likelihood of a crash before embarking on the trip by reading the New Delhi newspapers. But one headline in particular caught my attention, “India Tops World in Road Accidents.” I investigated the statement by reading a report published by The Central Road Research Institute of New Delhi’s (a think-tank charged with amassing the statistics of injuries and fatalities occurring on India while dedicating itself to solving the complex highway and transportation engineering problems). But even after reading the report I still didn’t comprehend how bad things would be once on the road. 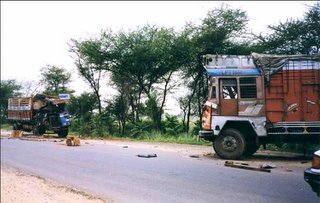 The report told me there were 1,860,000 miles of road in India (only the USA has more), yet 36 percent amount to little more than unpaved tracks; 73 percent of drivers did not understand or adhere to traffic laws and safety; and, 90 percent of commercial truckers are untrained and unlicensed. As if this were not bad enough, the report claimed 27 percent of all truck drivers drove intoxicated at night. By the time I got to the section that read 91 percent of ALL drivers needed glasses but did not wear them, I should have been rethinking the rationality of my journey. But at the time the numbers were just that, numbers in a book I was reading in the safety of my quiet living room in Nizammuddin East. My first day on the road gave a taste of road reality and it didn’t stack up to any of my city-driving experiences. All day truck, busses, cars whizzed by me narrowly missing my kneecaps. I screamed and shouted profanities, sometimes slipping my lahti from its sheath to brandish it at the driver. I thought it empowered me, as if the blood of Kali herself coursed through my veins. But it was waste of time and energy because if the Institute’s report was accurate, they were all too intoxicated, untrained, and blind to see or care about my safety or rules of the road. They drove under a different code, one that evolved out of Darwin’s survival of the fittest law where trucks and busses bullied taxis, taxis trumped cars, cars ruled over auto rickshaws, and they all retained the right to run motorcycles off the road. People traveling by motorcycle, the report said, are five times more likely to be killed in a road accident than someone riding in a car or bus. This was no surprise since people on two-wheeler don’t have the stability four wheels afford, nor do they have the protection the steel body of a car provides. I was forced into the soft sandy shoulder of the road no less than six times that day. Kali’s front tire grappled to grip the loose dirt and I fought for control and cursed. Yes, it had been a harrowing day, I thought as I shampooed my hair and hoped that in the months to come things would get better. When I emerged from the shower, I looked like a different person. I wandered the halls of the hotel in search of a restaurant and food. I passed the same desk clerk and bellboys who were on duty when I checked in but they took no notice of the new me. This made me smile secretly to myself, thinking the shower had changed me into someone unrecognizable. What I did not know was that the journey would turn me into someone I would not recognize at times. "Hindi is but one of fourteen languages officially recognized by the Indian government, including English. There are also thousands (some say hundreds of thousands) of distinct dialects"
A minor correction here-- India indeed has 18 different official languages, but only one *national* language, and that is indeed Hindi. For Indians throughout the country, even in places like Tamil Nadu or Orissa in the south (where I'm originally from) and Hindi isn't used much as a first language, you pretty much have to be fluent in Hindi to have any hope of running a successful business, going into politics or even just getting a government job. Even in south India these days, though, people will still often mix Hindi words into conversation-- colloquial Hindi, at least when not shoved down our throats, is sort of a link language. Excellent post otherwise, glad you liked India! Chicago Desi yout are right. I errored when I entered the number of languages in India as fourteen. I thank you very much for calling this error to my attention. I strive to have the most accurate information on this blog and am grateful to readers when they find an error. Getting the "facts" of India is not as simple as it should be. I checked numerous sources and found that the number of official languages varied between 17 and 18, and the number of dialects varied between 2000 and 22,000. That is a huge range. I think part of the problem is in the use of the word "official." A better way to state it is to refer to the number of major languages used throughout the states, that number would be 17 or 18 depending on the source. Shashi Tharoor says in his book "India from Midnight to the Millennium" that there are 17 major languages and 22,000 dialects. In the March 6, 2006 issue of Newsweek, writer Farred Zakaria says the same thing. If someone can cite an official government source and send me a link of the number of languages "official" recognized in India, I would be grateful. In the meantime, I will go with the number 17 as major languages and keep searching for the truth. Well, after the eighth schedule in 1992, the no. of official languages has gone uo to 22. See this site. The official Indian site says there are 22 languages. See link below for more details. i loved the indian road travel experience as dscribed by you. Yes indian roads are very dangerous to travel, and only one who is born with life saving skills can survive indian roads.